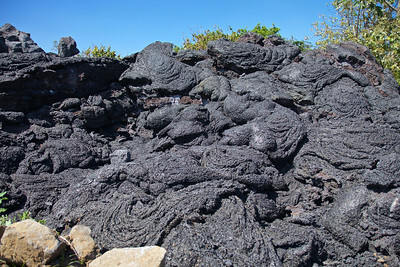 This is the youngest lava that I could get to. I asked a local if I could park and go have a look at the lava that is trying to claim his house. He said yes, the lava just over the berm 50 yards from my house. The little orange flag is marking to see if the flow is moving. In June 2014, a lava flow dubbed the June 27th flow started flowing from a vent of a spatter cone called Pu'u O'o on the east rift zone of Kilauea Volcano in a northwest direction towards the villages of Kaohe Homesteads and Pahoa. The lava flow has now set its sights on the community of Pahoa, Hawaii. On October 25, the flow had crossed Cemetery Road at Apa'a Road near the Pahoa Recycling and Transfer Station, a waste/trash station, which was closed and relocated due to the lava flow. The flow was quickly advancing on a nearby cemetery and triggered the first series of evacuations. On November 10, the flow claimed the first home. Officials fear that if the lava flow continues on its current path it will cover over the only route in and out of Pahoa, Highway 130. On October 22, The National Park Service announced that it would help state and county officials create an emergency route along 8 miles of the buried Chain of Craters Road in order to help Puna residents who will lose access to the rest of Hawai‘i if the current lava flow covers Highway 130. Construction of the Chain of Craters alternate route began by making a path over a wall of lava rock covering the road in Hawaii Volcanoes National Park. 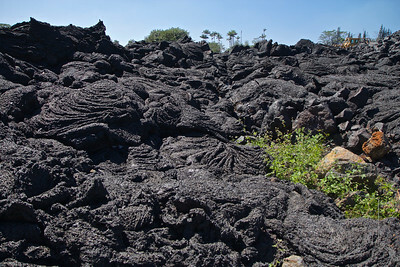 The $12 million to $15.5 million route, to be re-established between the park and Kalapana as a gravel road, could eventually be the only road in and out of lower Puna, if the June 27 lava flow makes its way to the sea. The park will close the end of Chain of Craters Road as construction began. Nearly 8 miles of the roadway, officially known as Chain of Craters Road inside the park and Highway 130 outside of it, is covered by past flows from the ongoing Pu'u O'o eruption that is now threatening Pahoa. Chain of Craters Road, which opened in 1965, had portions blocked or covered by lava for 37 years of its 49-year existence, according to the park. The road is about 19 miles long inside the park. This is the youngest lava that I could get to. I asked a local if I could park and go have a look at the lava that is trying to claim his house. He said yes, the lava just over the berm 50 yards from my house. In June 2014, a lava flow dubbed the June 27th flow started flowing from a vent of a spatter cone called Pu'u O'o on the east rift zone of Kilauea Volcano in a northwest direction towards the villages of Kaohe Homesteads and Pahoa. The lava flow has now set its sights on the community of Pahoa, Hawaii. On October 25, the flow had crossed Cemetery Road at Apa'a Road near the Pahoa Recycling and Transfer Station, a waste/trash station, which was closed and relocated due to the lava flow. The flow was quickly advancing on a nearby cemetery and triggered the first series of evacuations. On November 10, the flow claimed the first home. Officials fear that if the lava flow continues on its current path it will cover over the only route in and out of Pahoa, Highway 130. On October 22, The National Park Service announced that it would help state and county officials create an emergency route along 8 miles of the buried Chain of Craters Road in order to help Puna residents who will lose access to the rest of Hawai‘i if the current lava flow covers Highway 130. Construction of the Chain of Craters alternate route began by making a path over a wall of lava rock covering the road in Hawaii Volcanoes National Park. 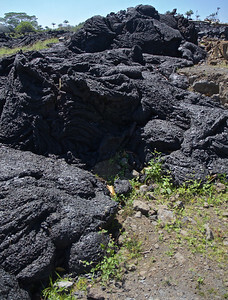 The $12 million to $15.5 million route, to be re-established between the park and Kalapana as a gravel road, could eventually be the only road in and out of lower Puna, if the June 27 lava flow makes its way to the sea. The park will close the end of Chain of Craters Road as construction began. Nearly 8 miles of the roadway, officially known as Chain of Craters Road inside the park and Highway 130 outside of it, is covered by past flows from the ongoing Pu'u O'o eruption that is now threatening Pahoa. Chain of Craters Road, which opened in 1965, had portions blocked or covered by lava for 37 years of its 49-year existence, according to the park. The road is about 19 miles long inside the park. This is the youngest lava that I could get to. I asked a local if I could park and go have a look at the lava that is trying to claim his house. 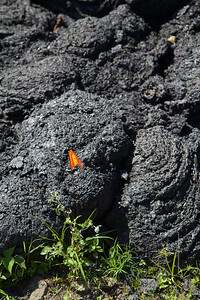 He said yes, the lava just over the berm 50 yards from my house. Workers are trying to divert the flow around the house. In June 2014, a lava flow dubbed the June 27th flow started flowing from a vent of a spatter cone called Pu'u O'o on the east rift zone of Kilauea Volcano in a northwest direction towards the villages of Kaohe Homesteads and Pahoa. The lava flow has now set its sights on the community of Pahoa, Hawaii. On October 25, the flow had crossed Cemetery Road at Apa'a Road near the Pahoa Recycling and Transfer Station, a waste/trash station, which was closed and relocated due to the lava flow. The flow was quickly advancing on a nearby cemetery and triggered the first series of evacuations. On November 10, the flow claimed the first home. Officials fear that if the lava flow continues on its current path it will cover over the only route in and out of Pahoa, Highway 130. On October 22, The National Park Service announced that it would help state and county officials create an emergency route along 8 miles of the buried Chain of Craters Road in order to help Puna residents who will lose access to the rest of Hawai‘i if the current lava flow covers Highway 130. Construction of the Chain of Craters alternate route began by making a path over a wall of lava rock covering the road in Hawaii Volcanoes National Park. 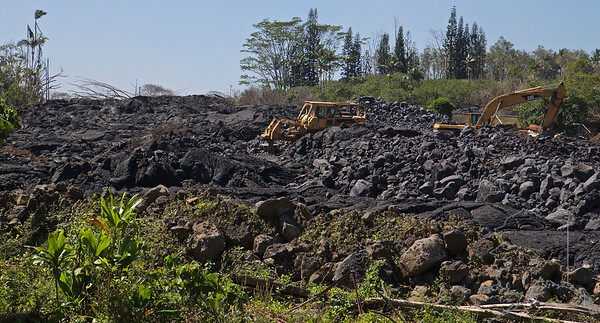 The $12 million to $15.5 million route, to be re-established between the park and Kalapana as a gravel road, could eventually be the only road in and out of lower Puna, if the June 27 lava flow makes its way to the sea. The park will close the end of Chain of Craters Road as construction began. Nearly 8 miles of the roadway, officially known as Chain of Craters Road inside the park and Highway 130 outside of it, is covered by past flows from the ongoing Pu'u O'o eruption that is now threatening Pahoa. Chain of Craters Road, which opened in 1965, had portions blocked or covered by lava for 37 years of its 49-year existence, according to the park. The road is about 19 miles long inside the park.